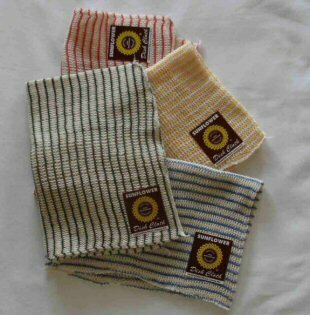 These dishcloths are the ones we have always used, and now we are offering them to you! Made from 100% cotton they come in handy for everything from washing dishes to wiping messy faces! They are made with a double layer of fine knit that is soft, ravel proof, very absorbent, long lasting, and easily cleaned. Colors are assorted. (blue, green, yellow & red) Best if washed at least once before you use them.